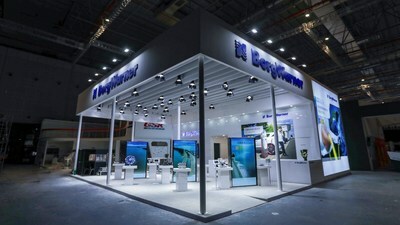 SHANGHAI, April 15, 2019 /PRNewswire/ -- BorgWarner, a global product leader in clean and efficient technology solutions for combustion, hybrid and electric vehicles, highlights its innovative electrification solutions at the 18th lnternational Automobile and Manufacturing Technology Exhibition (Auto Shanghai 2019) April 18-25, at the Shanghai National Exhibition and Convention Center. BorgWarner's vision of a clean energy-efficient world complements the show's theme "Creating a Better Life." BorgWarner's industry-leading electrification solutions will be on display including the latest fully integrated electric drive module eAxle iDM, Onboard Battery Chargers (OBC), and on- and off-axis P2 hybrid systems, which demonstrate its commitment to providing customized solutions for applications ranging from passenger cars, light and heavy trucks, to commercial and off-road vehicles. "Hybrids and electric vehicles have experienced robust growth during the past few years, in fact, it is estimated that hybrid and electric car production will reach about 32 million in 2023, accounting for roughly 30% of total global market," said Frederic Lissalde, President and Chief Executive Officer, BorgWarner. "BorgWarner has always been at the forefront of developing innovative technologies for hybrid and electric systems, and now has a series of solutions including the eAxle iDM integrated electric drive module, Onboard Battery Chargers, P2 hybrid solutions, P1+P3 hybrid solutions and 48-volt hybrid technologies. As a trusted partner of global auto manufacturers, we will continue to be a leader in propulsion systems solutions for combustion, hybrid and electric vehicles." The eAxle iDM is displayed for the first time in China. Featuring specially developed power electronics, it can easily be integrated at the front or the rear axle of passenger cars and light commercial vehicles depending on the architecture and the application. The solution integrates highly efficient power electronics with an advanced transmission system and industry-leading drive motor technology featuring BorgWarner's efficient bar wound stator solution to form a scalable compact package. With the eAxle iDM, BorgWarner delivers a product family of highly integrated propulsion solutions to drive customers' hybrid and electric vehicles, marking a big step toward a clean and energy efficient world. Thermal management is another major challenge in electric vehicles. BorgWarner assembles a range of thermal management solutions including cabin and battery heaters. The battery heater's fast response time enables optimal battery and cabin temperature management. The high-voltage cabin heaters create a comfortable interior made possible by its dual-zone heating and core temperature sensing abilities. With its wide range of products and solutions for the hybrid system, BorgWarner is dedicated to helping customers meet evolving demand from the growing trends of autonomous driving and connected cars. During Auto Shanghai 2019, BorgWarner highlights its on- and off-axis P2 modules, which provide OEMs the flexibility to place the electric motor where there is space in existing architectures. The modules also facilitate fast-to-market hybridization by enabling pure electric driving as well as hybrid functionalities such as stop/start, regenerative braking and supplemental electric propulsion. In the on-axis configuration, the electric motor is located directly on the main axis enabling easy integration and a compact overall package. It also allows for several clutch options and improves engine performance. The off-axis configuration places the electric motor parallel to the main axis for an even more compact axial package, which minimizes adjustments needed to incorporate with existing engines and transmissions. BorgWarner's P2 modules are capable of decoupling the engine for limited pure-electric driving, making it a desirable solution for hybrid architectures. They also enable easy integration and a compact overall package, offering high power density and increased fuel efficiency. BorgWarner's technical experts and engineers are available throughout the show to answer questions and share insights on the company's latest products and solutions at Hall 5.2, Booth 5BG001 of the Shanghai National Exhibition and Convention Center. Statements contained in this press release may contain forward-looking statements as contemplated by the 1995 Private Securities Litigation Reform Act that are based on management's current outlook, expectations, estimates and projections. Words such as "anticipates," "believes," "continues," "could," "designed," "effect," "estimates," "evaluates," "expects," "forecasts," "goal," "initiative," "intends," "outlook," "plans," "potential," "project," "pursue," "seek," "should," "target," "when," "would," variations of such words and similar expressions are intended to identify such forward-looking statements. Forward-looking statements are subject to risks and uncertainties, many of which are difficult to predict and generally beyond our control, that could cause actual results to differ materially from those expressed, projected or implied in or by the forward-looking statements. Such risks and uncertainties include: fluctuations in domestic or foreign vehicle production, the continued use by original equipment manufacturers of outside suppliers, fluctuations in demand for vehicles containing our products, changes in general economic conditions, as well as other risks noted in reports that we file with the Securities and Exchange Commission, including the Risk Factors identified in our most recently filed Annual Report on Form 10-K. We do not undertake any obligation to update or announce publicly any updates to or revision to any of the forward-looking statements.